Smartphone users with 4G are shopping online more than those without 4G (55% of 4G users do this compared with 35% of non-4G users); banking more online (55% versus 33%); watching more TV and video clips online (57% versus 40%); making more face-to-face and voice calls over the internet (28% versus 20%); sending more photos and videos via text (49% versus 36%); and instant messaging more with services such as WhatsApp (63% versus 50%). At least one 4G mobile broadband service is now available to 89.5% of UK premises, with four in ten people (42%) able to choose from all four 4G providers - EE, O2, Three and Vodafone. The mobile operators continue to expand their 4G networks, and Ofcom rules mean that 98% of premises will have an indoor 4G signal from at least one operator by 2017. Today, indoor 2G mobile voice coverage reaches 98% of people’s homes and offices. But that still leaves 2%, or half a million premises, without a signal. Ofcom wants to see the widest possible availability of communications services and is considering what further options might be available to improve coverage, both mobile and fixed-line broadband, as part of the Digital Communications Review. In the coming months, Ofcom will publish maps enabling consumers to compare operators’ mobile coverage throughout the UK. The maps will enable users to zoom to a specific location, or simply enter a place name or postcode, and receive data on coverage for each mobile network - down to 100 square metres. Smartphones now take more photos than any other device, including digital cameras, with 60% of adults saying they use it most to take a snap, rising to almost nine in ten (89%) of 16-24 year olds. Just over one in five adults (22%) mostly use their digital camera. People in the UK took an estimated 1.2 billion ‘selfies’ in the past year. Nearly a third (31%) of UK adults admit to taking a selfie, with one in ten (11%) doing so at least once a week. But not everyone is taking care of their digital snaps, with less than a third of adults (31%) backing up all their digital photos. Perhaps surprisingly, 16-34 year olds are the most careful, with 36% of this age group backing up all their digital pics, compared to just 29% of people aged 35 and older. This may reflect the fact that those aged 35 and over are more likely to have framed photos on the mantelpiece. Seventy per cent of them have their favourite photos on display, compared to half (52%) of 16-34 year olds. Mobile phones may be a permanent fixture in our daily lives, but tweeting or updating social media status when sitting down to dinner remains a no-no for most people. Over half of people (55%) think it’s unacceptable to pick up your phone alongside your knife and fork. Yet four in ten people (42%) admit to checking their phone at the dinner table. But despite our increasing mobile use, birthday greetings still require more than a text message. The traditional card sent through the post remains the most popular way to say ‘Happy Birthday’, with two fifths (38%) of people choosing to hand write their birthday wishes, compared to 15% using social media and just 7% sending a text message. 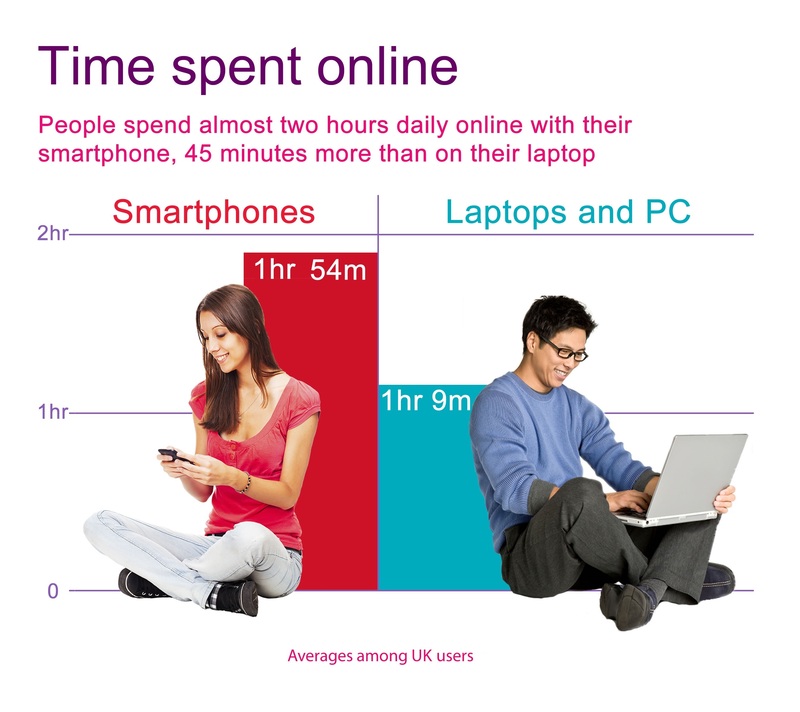 Increasing take-up of smartphones and tablets is boosting time spent online. Over half of UK households (54%) now have a tablet, a rapid rise in popularity from just 2% in 2011. Ofcom research3 shows that internet users aged 16 and above said they spend nearly 10 hours (9 hours and 54 minutes) online each week in 2005. It had climbed to over 20 hours and 30 minutes in 2014. Overall, people think their time online is bringing benefits. Almost two thirds (64%) of online adults agree that being online is invaluable for keeping them informed about current issues, and six in ten (60%) agree it helps keep them in touch with close family and friends. But people overwhelmingly prefer to catch up with friends and family over a cup of tea. Almost seven in ten (69%) prefer to chat with family face-to-face, and 64% prefer to speak to friends this way, compared to just 3% who prefer social media for staying in touch. People’s growing reliance on smartphones and tablets appears to be affecting TV viewing. Most 16-24 year olds are watching on-demand and catch up programmes on computers and smartphones rather than on a TV connected to a set-top box. Nearly six in ten young people (57%) regularly watch on demand and catch-up TV on their laptop or PC. Almost half (45%) watch on a smartphone, and four in ten (40%) switch on a set-top box. On smartphones, short-form video clips are even more popular than watching a film or TV programme: 42% of people say they watch short videos from services including YouTube, Instagram Video and Vine on their phone, compared to 21% watching a film or TV programme. But, despite the growth in online viewing, TV still reaches the overwhelming majority of people. Over 90% (92%) watch TV each week, down slightly from 93% in 2013. However, we are spending less time in front of the TV. On average we spent 3 hours and 40 minutes a day watching on a TV set in 2014, 11 minutes less than in 2013 and the second consecutive year of decline. The greatest drop was seen among children (aged 4-15), falling by 12% from 2 hours and 14 minutes in 2013 to 1 hour and 58 minutes in 2014. Those aged 25-34 watched nearly 9% less, from 3 hours and 5 minutes to 2 hours and 49 minutes while 16-24 year olds watched 6% less TV, from 2 hours and 28 minutes to 2 hours and 18 minutes. Over the past five years, average monthly household spending on communication services has decreased in real terms, from £122.07 in 2009 to £117.71 in 2014 - representing a monthly decrease of £4.36, or £52.32 per year. General satisfaction levels with communications remains high: 86% of adults are satisfied with their broadband, both fixed and mobile. 91% of adults are satisfied with their mobile service, and 89% with their fixed-line phone. Total telecoms revenues fell by 2% to £37.4bn in 2014, largely as the result of falling wholesale service revenues. Fixed internet revenue growth accelerated as a result of increased fibre take-up. Retail residential and SME fixed internet revenues totalled £4.9bn in 2014, up from £4.2bn in 2013. 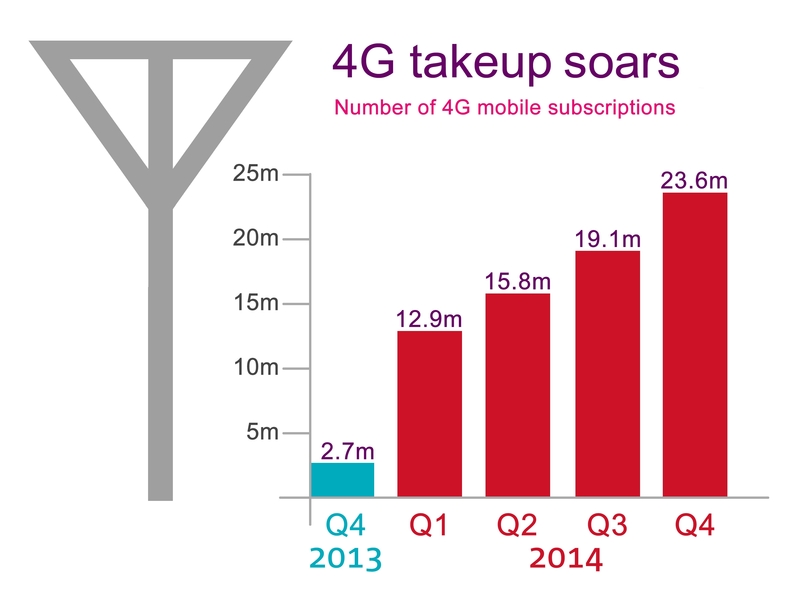 There are now 23.6m 4G subscriptions in the UK, 28% of mobile subscriptions, compared to just 3% (2.7m) in Q4 2013. SMS use fell for the second consecutive year, from 129 billion messages in 2013 to 110 billion messages in 2014, largely due to increasing smartphone take-up and use of internet-based communications. Newer online methods of communications are gaining significant levels of reach among online adults. Social media (62%), instant messaging (57%) and VoIP calls/video (34%) are used by many people for communicating with friends and family. Picture messaging services are used by a third of online adults for communicating with friends and family (34%) and a quarter use Twitter (24%). Pay-TV subscription revenues were up 1.9% from £5.9bn to £6bn in 2014. Online TV revenue increased by 38% in 2014 to £793m, with income from online TV subscriptions increasing by 53% to £317m, according to data from IHS. Over half (56%) of UK TV homes had a TV connected to the internet, either via a set top box or smart TV, by the end of 2014, according to research from media consultancy 3 Reasons. Total industry revenue and spending increased by 3.6% to £1.2bn in 2014. Commercial radio revenue grew by £22m to £483m and spending by the BBC increased by £20m to £725m. On average, nine in ten adults (89.5%) tuned into the radio in 2014 and spent just over three hours listening each day (3 hours and 3 minutes). This is down by six minutes per week on average year on year. Among regular music listeners aged 16-24, streaming services are as popular as radio stations. Around two fifths (39%) of this age group use streaming services to listen to music, similar to the proportion who listen to music on the radio. Adults in the UK said they sent six letters, cards or parcels in an average month, slightly down on 2013 (6.7 items per month). UK adults said they received an average of 8.5 letters, cards or parcels in an average week. Email is the most common replacement for post across all age groups. Almost eight in ten (77%) 16-34s who are sending less post than two years ago say they have replaced post with email. Source for all data is Ofcom, except where indicated below. 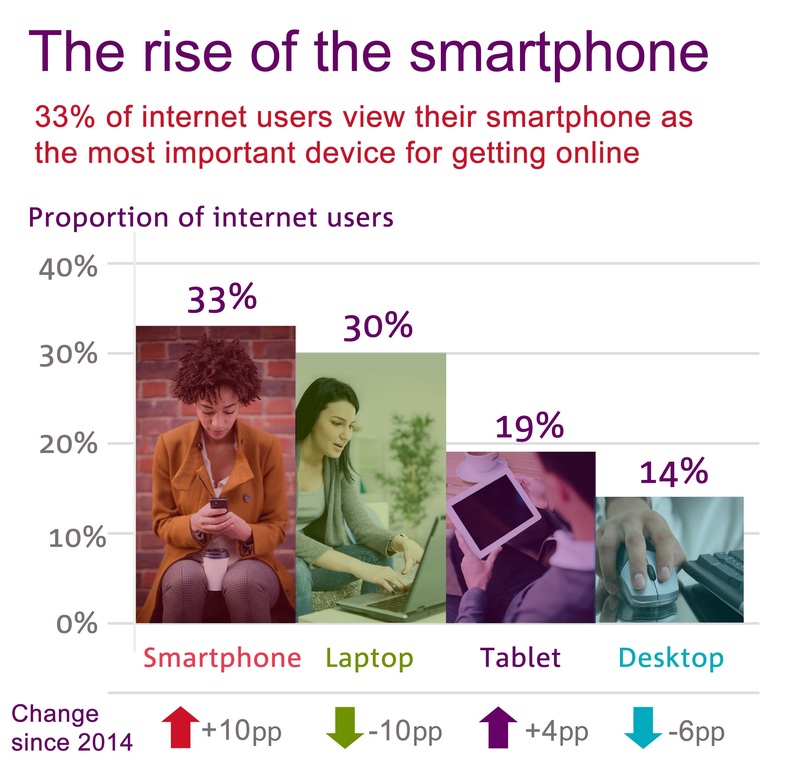 Ofcom’s Media Use and Attitudes 2015 report. Under the Communications Act 2003 (the Act), Ofcom is required to research markets and to remain at the forefront of technological understanding. Ofcom is also required under section 358 of the Act to publish an annual factual and statistical report. Mae darpariaeth symudol a band eang yn gwella yn y DU, ond mae gormod o ardaloedd gwledig yn parhau i gael signal gwael – yn ôl astudiaeth sylweddol Ofcom ar rwydweithiau cyfathrebu’r DU. Brits are ditching their DVD players and desktop PCs and increasingly turning to newer technology – with smart TVs and smart watches on the rise – Ofcom figures reveal.